With Infinito Wallet’s big 2.5 update, the App Square now offers full support for decentralized applications on the EOS platform! This new feature represents the efforts of the Infinito team and their EOS technology partners. As more DApps arrive on Infinito Wallet’s App Square, the wallet is building on its already incredible universality for leading virtual assets with the inclusion of DApps built on smart contract blockchains. 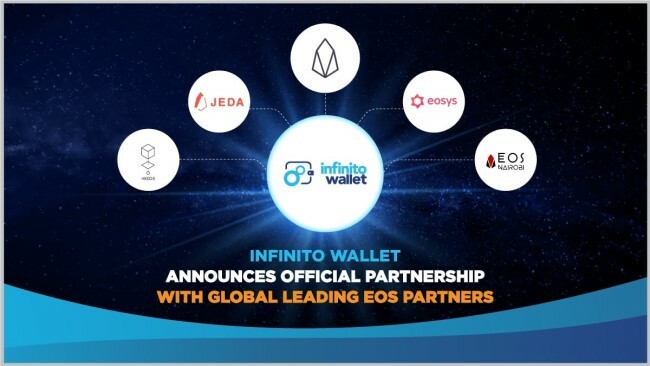 This news adds to the global praise that Infinito Wallet has already received as one of the premier wallets for EOS assets. In addition to the Transact and Check Balance functions, Infinito Wallet users now have a full set of fundamental EOS features that include support for EOS assets, stake/unstake NET and CPU bandwidth, buy/ sell RAM, and import/ export EOS private keys. 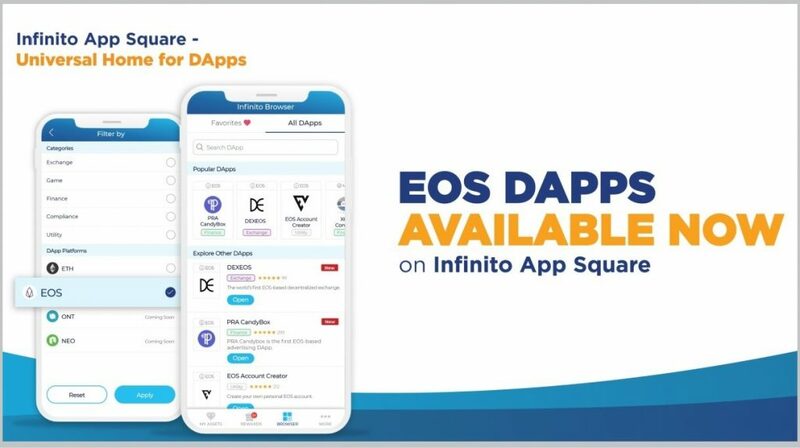 Infinito Wallet also hosted several free EOS account registration campaigns, with the biggest being a collaboration with many EOS community partners, some of which has helped Infinito make EOS DApps support on App Square possible in this update! Step 3: Pay and you are good to go! In order to take advantage of this service, the user needs their EOS private-public keys ready so users should have them on their 12-word Passphrase Wallet or Private Key Wallet. With this service, users can create an EOS account right inside the App Square and never risk using obscure or malicious services found online. The Infinito team has added this service to let users easily join the EOS ecosystem and benefit from all features of the EOS blockchain all within Infinito Wallet. DEXEOS is a decentralized exchange that provides a transparent and convenient EOS trading service. Users can easily monitor real-time prices of over hundreds of EOS currencies and easily buy and sell them instantly with highly competitive rates. Unlike other exchanges, DEXEOS does not require users to register KYC profile, nor does it mandate users to import or create a separate wallet on DEXEOS server. Users can simply use their existing EOS account to start trading! PRA CandyBox is the most popular EOS virtual currency distributor DApp. Many free EOS airdrops can be found on this DApp and they are ready to be claimed by users every one to four hours, depending on their account level. Infinito users are able to increase this level by depositing EPRA, PRA CandyBox’s proprietary currency, into their account to claim up to twelve airdrops per hour. Simply select any airdrop project, enter your wallet password, then tap “Confirm” to receive free tokens. In future updates, Infinito will enable EOS voting and seamless management of virtual currency portfolios from various platforms. The Infinito team will also include more Tab Bar Customization options, additional UI/ UX improvements, and support for DApps built on NEO, Ontology, and others. Do you have a great DApp and you are ready to instantly reach more than 60,000 monthly active users out of over 400,000 total downloads? 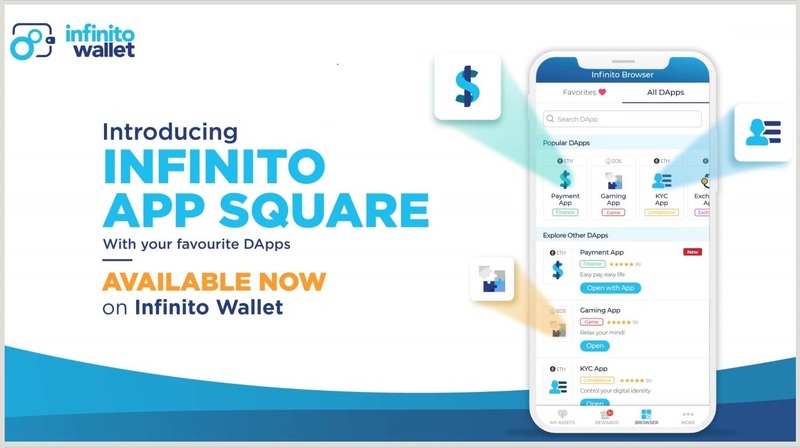 Get your DApp listed on the App Square today via info@infinitowallet.io. For DApp developers, the Infinito team also provides a development platform to help you develop DApps faster and easier. The newly introduced Infinito Blockchain Platform (IBP) has a long list of blockchain modules including API/SDKs, Software-as-a-Service (SaaS), Solutions, DApp and Smart Contract templates, and more. Contact info@infinito.io for more information. Decentralized applications (DApps) operate on smart contract blockchains with no central server. Such apps can serve a variety of functions such as Finance, Exchange, Game, Social, Compliance, Education, and more. Since DApps are blockchain-based, they offer more transparency and security than regular apps in regards to payments and data storage. Positioning as a leading universal wallet for virtual currency traders, Infinito Wallet serves as a gateway for users to maximize usage and potentials of their virtual assets. By selectively expanding their partner network, Infinito Wallet aims to build an ecosystem of practical blockchain services including exchanges, ID/KYC solutions, and other blockchain-related business services. At the same time, their supports communities of developers and businesses with an open blockchain infrastructure of technologies and compliant-ready services, so that they can seamlessly build, launch, and operate innovative products and services efficiently. View the original article on Infinito Wallet’s website here.